The popular belief is that people go through trials and tribulations as Saturn (Senasuru) which is considered the most dreadful of all planets, transits to the zodiac sign. 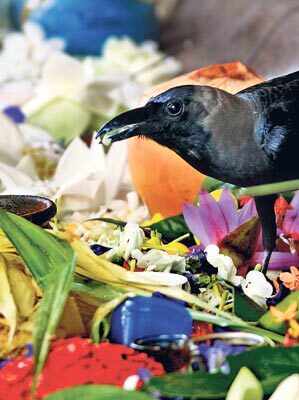 People held Senasuru poojas at the Kelaniya Rajamaha Vihara this week and offered milk rice to crows, considered the vehicle of Saturn. Pic by M.A. Pushpa Kumara. The beautiful star of ‘Akasa Kusum’ has a not so secret alter ego. Auntie Netta is Nimmi Harasgama’s funny side and she’s here to stay. Filmed on a webcam, Auntie Netta with her strange hair, strange expressions and even stranger opinions is very popular on the internet - you can find several of her short films on YouTube. A crisis in the tourism industry may jeopardise a US$20 million World Bank (WB) funded capacity building project for the institutions which fall under the Ministry of Tourism in what is the first time, the world over, the WB has been involved in a tourism project. Is Baluchistan becoming another East Pakistan? Islamabad faces today practically the same situation in Baluchistan as it did in East Pakistan. The former is as increasingly getting alienated from Pakistan as was Bangladesh in the midst of liberating itself. The army was supreme then as it is today in Baluchistan. Imperial Institute of Higher Education (IIHE), one of the premier private tertiary education providers in Sri Lanka, established in 1996, is re-locating its campus to a building in the heart of Colombo. The Government is to make a strong plea to the European Union to continue the “GSP Plus” trade concession for Sri Lanka’s garment exports despite claims to the contrary by senior officials. Two senior Government dignitaries -- Prime Minister Ratnasiri Wickremanayake and Ports Minister Chamal Rajapaksa -- who traveled to Japan for what was billed as an "Exposition of Sacred Relics of Lord Buddha", it has come to light, were unsuspecting victims of a move to misrepresent Buddha's relics, misuse Sri Lanka's name and engage in a human smuggling operation. These two pages - our Political Commentary for the week, and the Foreign Minister's interview -- detail the country's unofficial and official stance on foreign relations today. It is not a rosy picture that we see. It was noon Saturday (September 5) when Air Traffic Controllers at Japan's Narita International Airport cleared Sri Lankan Airlines flight UL 454 to land. The Airbus A-330 taxied to a halt at an arrival gate in Terminal 2. “I think it must be Britain, Bindu...” Bindu’s father Percy suggested. Drive along a twisting road to Udugama from Galle, and you will stumble upon one of the best kept secrets of the South. September is the Literary Month – the month when activities to promote literature and the reading habit are held. Powered by a a timely knock of 98 by veteran Sanath Jayasuriya and a versatile and effective knock of 91 not out by fast improving left hander Thilina Kandamby, followed by a brilliant spell of bowling by Angelo Mathews, Sri Lanka powered their way into an imposing 139 run win in their precursor to Monday's final in their tri-nations triangular against India at the R. Premadasa Stadium yesterday. GSP Plus: Was there another way? Interest rates falling, but banks not responding: Why? Aney Is It True ? Looking for the Best International Degree for your investment? NEXT - The largest CIM institute commences new batch in Sept. for March 2010 exams! EDUCATION: Is that investment? Is that knowledge? Is that skills? Dr. Uditha Liyanage at TMC "Tough Times…? Be brilliant on the basics"